At SpaForever in Chicago, IL, we understand the desire for beautiful, youthful-looking skin and offer a variety of services to help you achieve your personal beauty goals. 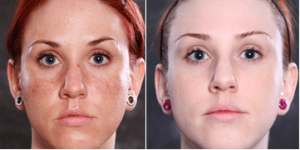 Our IPL photofacial treatments, also known as photorejuvenation, offer patients a noninvasive, effective alternative to other procedures that target skin issues all over the body like sun damage, rosacea, and large pores. By using light to penetrate deep into the skin and restoring the cells of the skin’s middle layer, photofacials Chicago can help you achieve even skin tone and texture. Stop hiding your skin and come in today to find out how we can help you attain beautiful skin! The effects of skin damage and aging affect all layers of the skin. Photofacials can work to repair this damage and restore all layers of the skin by using specialized technology that targets the skin’s deeper layers and fixes skin problems from the inside-out. 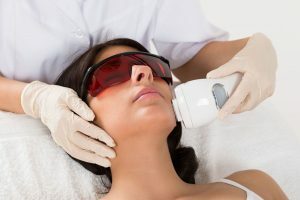 IPL (Intense Pulsed Light) Photofacials work by using a device that emits a powerful source of light which targets the middle layer of the skin. By controlling the way the light is emitted, providers can avoid damage to the top, visible layer of skin while still targeting the source of many common skin issues. Your practitioner can filter the wavelength of the light emitted onto the skin to treat different issues more effectively. What Skin Problems do Photofacials Treat? Photofacials Chicago can be used to treat a wide variety of skin issues in different areas including the face, neck, back, hands, legs, and chest. Patients suffering from issues such as age spots, sun spots, spider veins, redness, enlarged pores, hyperpigmentation, and rosacea can benefit from the procedure. Other benefits of the treatment include increased collagen production, tightening of the skin, and renewed skin texture and tone, as the procedure works to repair the underlying causes of damage and degeneration. During the procedure, one of our staff members will apply a gel to the area that you are getting treated and will use a special device to pulsate waves of light into the deeper layers of the skin. During the procedure, your practitioner will provide you with goggles to protect your eyes from the light source. Procedures take as little as twenty minutes and require little aftercare. Many patients report that the procedure is painless and have compared the experience to a warming sensation across the area being treated. Is there Required Recovery or Downtime? No. Unlike other skin rejuvenating procedures, photofacials Chicago is noninvasive, as the process does not require any incisions or injections. Many patients are able to return to work or go out immediately after the procedure. Potential side effects of the treatment can include swelling, increased sensitivity, redness, and temporary discomfort or discoloration, but these symptoms generally resolve themselves within a few hours. Compared to other options like chemical peels or laser resurfacing procedures, photofacials do not have as many uncomfortable side effects and they can lessen recovery time. Because photofacials target the middle layer of skin, patients can expect to see results within three to nine weeks following the procedure, depending on your skin type and the treated area. Patients will see the best results after four to six photofacials and can undergo treatment every four weeks. Many patients undergo repeated procedures until they attain their desired results and then do the procedure once a year as upkeep. To learn more about how photofacials Chicago will affect your skin and how many treatments you will need to see results based on your skin type and concerns, we recommend that you contact our med spa to set up a consultation with one of our team members. At your consultation, one of our nurses or physicians will meet with you to discuss your skin problems and will work with you to assess whether a photofacial procedure is right for you and your needs. Your practitioner will ask you some questions about your medical history to determine whether you are eligible for the procedure and will answer any questions you might have about the photofacials and how they can help repair your skin. At SpaForever, we offer affordable, quality aesthetic services that help you to be your best self. We offer photofacial procedures at our top-rated med spa in the beautiful neighborhoods of Bucktown and Wicker Park. To learn more about the procedure, we recommend that you schedule a free consultation so you can meet one of our expert staff members to discuss how to achieve skin that makes you look and feel great. Stop feeling embarrassed about your skin and call us today. We can’t wait to meet you and be apart of your skincare journey! *Individual results will very, and the information on this page does not guarantee your eligibility for treatment or the results you will have. A medical examination is required before approval of procedure.